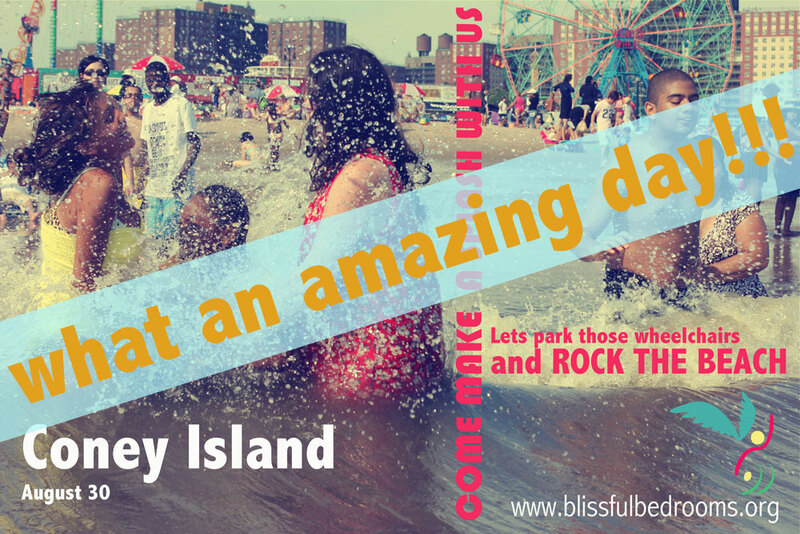 Here at Blissful Bedrooms, our hearts are full of contentment and happiness because we all had the best day ever at the Annual Beach Day 2012. If you could have seen their smiles and heard their laughter, there are no words. The ocean wasn’t the only thing rippling, Blissful Bedrooms sent out ripples of love and unity up and down the Coney Island shore line. Several strangers approached us and asked how they could be involved and helped us carry things when we were packing up for the day…..a random man came with a bag of candy and distributed it to our friends (sealed of course, lol)……..people just watched in discrete awe as they witnessed the love, the joy, the kindness, the compassion. We are truly blessed to feel so fatigued and spent after this long, long day……..We all have the greatest love hangover that we don’t want to get over. What better way to spend our energy than on cultivating laughter and smiles. Thank you to the volunteers and donors who helped make it happen. Our admiration and respect for you is boundless. Immense gratitude to the so-called disabled individuals in the Blissful Bedrooms community for giving us the opportunity to serve you and know what true fulfillment and love really is……I know without a doubt that it is not you who needs us, but us who desperately needs you.